So you have recently learned that what used to just be your sore knee, back, or hip is in fact OA or osteoarthritis. Naturally you are wondering “will this ever feel better?”. While osteoarthritis cannot be cured, a good physiotherapist can certainly teach you how to manage the problem and minimize its impact on your life. Osteoarthritis is simply pain and inflammation of a joint. 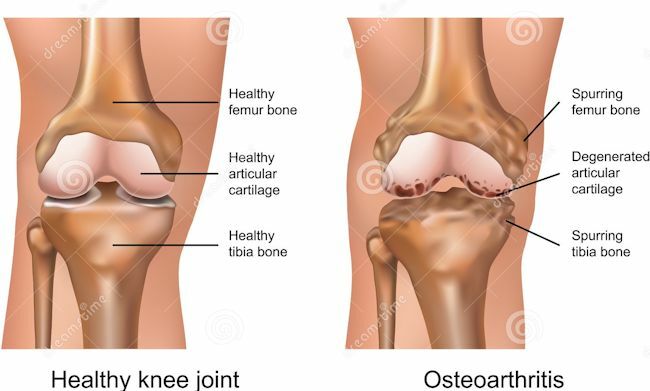 There are many factors that determine who will get arthritis, from bony alignment, to genetics and overall bone health, but it is commonly thought of as “wear and tear” of the joints. If the micro-damage that your everyday activities create exceeds your ability to repair, the eventual result is OA. So what can you do? Here are a few things to think about. Get moving – arthritic joints do better when they are getting regular low impact exercise. This may seem counterintuitive but if you monitor your pain closely you will notice that there is a happy medium of active exercise without over doing it and when you are sedentary pain and stiffness sets in. Get strong – Physiotherapy for OA is focused on figuring out how to strengthen your body in a way that will decrease any excess stress that your joint is experiencing. Get lean – Studies show that our weight bearing joints feel much better if we can trim some of the extra weight. Talk to your doctor – some people need to take anti-inflammatory medication in order to maintain their activity or to help with flare-ups. Your doctor will help you to decide if this is a good approach for you. This is a condition that is effectively treated by physiotherapy so take control by making an appointment now. We will help you to develop a plan to get back to your active lifestyle! Cornerstone Physiotherapy is located in downtown Toronto.